It's white's turn. Are the marked stones dead? No, it is seki. White cannot approach at a or b, and black can't either. To approach at b, white needs to play and first, but after white still cannot approach, and capturing will not help. 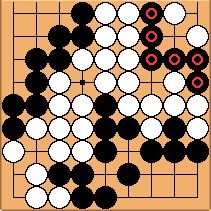 So since neither player can ever approach, the position is seki. If both player passes, what will happen to the score? Neither player gets any points in seki. So black gets points for the upper left and lower right, and white gets no points on the board at all. Both players do of course does get points for any captures made, so correct play for white is to play as I indicated, then capture to get 1 point for that. I see ^^ Thank you very much for the information.